Travel tips and photographs for Norway. Norway made a big impression on me in 1981 when I was 25 years old, as recounted below. I gladly returned to Norway in 2011 (see separate article) with Carol. With continental Europe’s lowest population density, Norway offers vast unspoiled wilderness, lit in summer for 24 hours a day. Comfortable backcountry huts (mountain refuges) form a vast network, making Norway one of the best places in the world for overnight hut walking and cross-country skiing. Norwegians greatly respect their natural world, a land of difficult terrain, cold winters and brief summers. Perhaps their active connection with the outdoors has helped give Norwegians the longest life expectancy of any nation on earth. Glaciers have deeply gouged Norway, creating steep cliffs & deep fjords, which slowed the building of roads, railways and communication lines, until oil was discovered. Roads starting from sea level must negotiate 3000 to 6000 feet up the glacial U-shaped valleys to reach the central plateau that forms the bulk of Norway. Fjords stretch inland as far as 125 miles at Sognefjord, and have historically linked the country by boat. If unraveled, the fjord-pierced coastline would stretch for an amazing 21,000 miles, inspiring the Norwegian expression “the sea unites, but the land divides.” Norway, which is 20% smaller than California, stretches 1100 miles from the latitude of northern Scotland up to the North Cape (320 miles north of the Arctic Circle). Half of Norway lies above the Arctic Circle, if you include the large islands of Spitzbergen located far north in the Arctic Ocean. Despite its high latitude, Norway’s climate is relatively mild. The North Atlantic Drift, partly fed by the warm Gulf Stream, keeps the fjords ice-free in winter as far north as Hammerfest, at 71° North latitude (at what would be icy Alaska’s most northerly point). Nevertheless, Norwegian summer can feel like the winter of a Mediterranean climate (such as found in Chico, California, where I was raised). Norwegians actually pioneered the study of weather because, as one local told me, “Norway gets so much of it.” Two out of three days are cloudy in summer, surrounding the peaks and plateaus with mysterious mists, until every third day when sun shines glory upon the spectacularly carved mountains. For a more memorable trip, explore areas away from heavy tourist influence, such as away from train lines and during the off season. In 1981 when I was 25 years old, I traveled around the world for nine months, an adventure of a lifetime, visiting New Zealand, Nepal, Norway, France, and Switzerland. In the poor health conditions of Nepal, I had lost 15 pounds (7 kilograms), and I looked forward to better conditions in Europe. After two weeks with friends in Germany at Frankfurt and Emmendingen (near Freiburg), I recovered my zest for travel and looked forward to experiencing new countries in Scandinavia using a Eurail Pass. A little research in Oslo convinced me to concentrate two months of hiking in mountainous Norway. Starting in Frankfurt, Germany on June 1, I began a round trip by rail that would return July 29. I knew little about Scandinavia at first, and planned my 58-day tour one week at a time. As I approached island-bound Copenhagen (capital of Denmark), I was amazed as our train boarded a large ferry in several pieces for a one-hour crossing. With a flash of my American passport, I passed through the surprisingly cursory border check. At first, I worried about the potential loneliness of traveling alone so long in a foreign country; but soon I would meet dozens of friendly Norwegians including an Ole, Ola, and Olav . . . . In Oslo, Norway’s largest city, I reached a higher latitude (60° North) than I had even been, and said goodbye to stars for the next 55 days, with light skies around the clock! I studied glossy bookstore pictures of Scandinavia for three days, concluding that I should give up on seeing Finland and most of Sweden in favor of spectacular Norway. The following wonderful book became my “bible” for the trip: Mountain Touring Holidays in Norway, published by the Norway Travel Association, Oslo. At the excellent non-profit Norwegian Trekking Association (DNT, or Den Norske Turistforening, in 1981 known as “Norwegian Mountain Touring Association”), I bought an inexpensive one-year membership. DNT provides a master key for self-service huts and joins you with all 30 local mountain touring associations which maintain huts, mark trails, guide trips, and teach courses. At DNT, I learned that most mountain walking areas were covered in snow until the end of June. I might be too early! In mountain elevations from 3000 to 8000 feet, summer only lasts from the end of June to the beginning of September. Luckily, below 3000 feet, summer extends from early May through September. While waiting for snow to melt in mountain areas, I would first visit lower-lying areas of Norway, such as the moors of Østerdal-Femund, the islands of North Norway, and the fjords of southwest Norway. I rode the train to Røros, located in the Østerdal-Femund area, in the eastern rolling hills, which lie in the snow shadow of the mountainous central plateau of South Norway. Copper was mined in Røros for 333 years, and the remaining ghost town is a UNESCO World Heritage Site complete with turf-roofed houses dating from the 1700s and 1800s. From Røros, I hiked on snow-free, squishy yellow reindeer moss, rushing to reach the alpine Marenvollen Hut before nightfall, which never came. I realized that the skies would be light all night, a novelty for me. I tired before reaching the hut, and camped outside in the open pine moor using my new Goretex bivi (bivouac or bivy) sack for the first time. I strung a poncho over the bivi sack as double protection against the continuous drizzle. I would end up bivying for free outdoors on 23 nights out of 58 on the trip, which was very economical. By camping frequently and buying all food in grocery stores, I spent a frugal $15 (or 90 kroner) per day in 1981. By Norwegian law, you can freely camp on any unfenced land located at least 150 meters from buildings. On fenced land, I just asked the farmer if I could camp there, and he usually gave me permission (plus sometimes a dinner and hot shower). The next morning, a wet walk through open pine moors brought me to Marenvollen Hut. Using the self-service hut key obtained from DNT in Oslo, I entered the building as the first visitor of the “summer.” I was amazed by the pristine polished wood interior and complete kitchen, with propane stoves, china plates, silverware, pots, pans, dish cloths, and so forth. Although I had carried in my own food, the complete pantry provided stores of dried and canned foods for purchase on the honor system. The separate dining room contained couches, chairs, and tables, all warmed by a pot-bellied stove. Pre-cut wood for the stove filled half of the separate work room, which also contained various household tools on a large work bench. Four rooms with four bunks each provided foam mattresses and blankets sporting the DNT logo. Another pot-bellied stove heated a separate drying room for wet clothing and boots. On top of all these luxuries in the wet wilderness, this delightful haven provided two pristine pit toilets within the building. Stunned by this mountain Ritz, whose contents would be picked clean in most other countries, I obediently slipped my fee into the honesty box. I had this great hut completely to myself. Welcome to the wonderful Norwegian hut system! Out of 58 nights in Norway, I slept 15 nights in the fabulous yet inexpensive Norwegian huts. Nine of these were staffed mountain hotels where I could have bought hot meals; but I usually carried all my own food. I loved the six self-service huts in which I stayed, where I could cook hot meals from food that I had frugally carried in myself; or, in a pinch, I could have purchased food from the extensive self-service pantry, making payment in the honesty box. To return to the train station at Røros, I walked a few hours to a highway and with some trepidation, tried my hand at hitchhiking for the first time in my life. Only four cars passed before I received a ride for 10 miles straight to town! Bouyed by this initial success, I would eventually hitchhike in 50 rides for a total of 1100 miles, the length of Norway. Once I got over my initial reluctance for hitchhiking, which is discouraged in most countries, I considered it a great way to see Norway. No other method of travel allows you to meet as many local Norwegians. Hitchhiking costs nothing except patience, and paid me back with a priceless experience. All kinds of people gave me rides. My most likely ride would come from a single driver who probably lived within 30 miles. Sometimes I studied the cars as they passed without indicating that I wanted a ride, ignoring the cars with tourist luggage and trailers. On several occasions, I would spot a young single driver with no visible luggage, I would extend my hitchhiker’s thumb signal and the driver would immediately stop for me, despite little space to turn off! slow road conditions, such as an uphill climb or a town’s speed zone. a clear line of sight for at least 10 seconds in order to give the driver time to examine you. a visibly wide turnout for the driver to stop just past the hitchhiker. Some letters are pronounced differently in Norwegian compared to English, such as g and j, which are softened to a “y” sound before certain vowels, as in “fjord (fyourd) and “Geilo” (yaylo). After the train ride from Røros through some good scenery and gorges to the city of Trondheim, I slept at the inexpensive Ungdomsherberge, or Youth Hostel. Staying in youth hostels for 10 nights out of 58 helped keep my costs low. Strolling through town, I was surprised by the large number of baby carriages, each which sported a storm fly like a tent! In fact, I saw a plethora of baby carriages everywhere in Norway: folded and strapped to the roofs speeding cars, stashed on public buses, and pushed by proud mothers along city streets, country roads and grassy fields. Norwegians greatly value motherhood. In Sweden, icy sleet battled with warm sun on my ascent up the ski slope of Mount Åreskutan (4680 feet elevation). On top was a beautiful view of the smooth, snow-patched hills that roll over the Swedish border from Norway. However, most of southern Sweden is a plain punctuated with many rivers and lakes. In contrast, rocky mountains cover 72 percent of Norway, which claims almost all the rugged grandeur to be found in Scandinavia. I slept overnight on the long train ride up the Swedish coast. After shopping for groceries in Boden, Sweden, I continue north on the train towards Norway, crossing the Arctic Circle (66.5° North latitude) for the first time in my life. Looking at the snow-covered bogs of Lappland, I couldn’t believe this was June 11th. I had wanted to hike in Abisko National Park in northern Sweden, but the heavy snow outside kept me on the warm train. As the train descended to Narvik (68° North latitude) at 11:30 PM, I gazed down in awe at my first Norwegian fjord, 3300 feet below. The midnight sun almost succeeded in piercing the overcast sky, tantalizing me and my carload of boisterous German tourists. After camping overnight in a park in freezing Narvik, I waited through two cold, rainy days for better weather. As I wandered the frigid streets, I noticed in front of every dagligvarer (“daily goods”, or grocery store), a waste basket boldly proclaimed ÅPEN. . .DIPLOM IS, which means “Open…Diploma Ice Cream”. All over Norway, ÅPEN waste baskets boldly proclaimed the various ice cream brands, such as Dola Is and Jotun Is. Despite their cold climate, Norwegians love eating this frozen dessert. In agreement, I ate a full liter of ice cream in one sitting. Finally, on my third day in Northern Norway, the clouds parted to reveal the bluest of skies on a fine summer day with shirt-sleeve weather. As I walked half way up the hill above town, I was surprised to see the Narvik Hang-Glider Club poised for flight at the ski lift terminus. Continuing to the top of the mountain revealed a fantastic view of Narvik, its fjords and mountains. That day I began a hitchhiking trip that would take me from Narvik to Stamsund, 225 miles through the Lofoten and Vesterålen Islands. The wild and jagged peaks of these beautiful islands rise up to 3600 feet, often directly from the ocean, forming the imposing “Lofoten Wall” when viewed from the mainland. At their feet lie picturesque fishing villages and rorbus, which are traditional fishermen’s shanties perched on piers and painted in brick red. Since modern fishermen live at sea when fishing, rorbus now accommodate tourists. These remote islands offer unspoiled mountains, rich bird life, fishing holidays, pleasant daytime temperatures averaging 56° F (13° C), and great views of the midnight sun from May 20 to July 24. In contrast to the “light season”, the sun never rises above the horizon between the end of November and mid-January. But winter is not entirely dark, as snow brightens the land and the ethereal “northern lights” (or in latin, aurora borealis) colorize the skies. Rich cod fishing has attracted tens of thousands of people to settle the Lofoten and Vesterålen Islands. Although the fisheries lie north of the Arctic Circle, the warm waters of the North Atlantic Drift (and Gulf Stream) carry rich plankton to feed the fish caught by the world’s largest cod fishing fleet. From January to April, fishermen work 20 hours a day as the cod arrive from the Barents Sea to spawn between the Lofoten Wall and the mainland. In mid-June 1981, I was awestruck by acres of cod hung on huge racks drying everywhere in the arctic air. As of 2004, severe overfishing of spawning cod by competing countries has provoked crises and restrictive quotas in the cod industry. 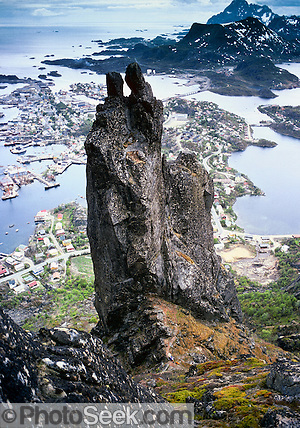 On Langøy (“Long Island”), I hitchhiked to see knife-shaped Mt. 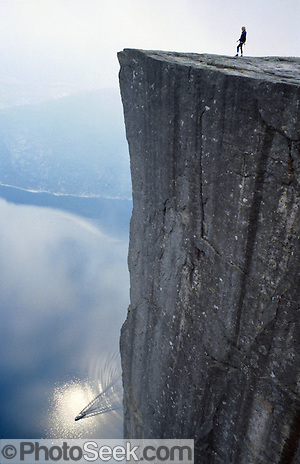 Reka (1991 feet), one of the most striking mountains in Norway. A local electrician, Jarle Sivertsen, picked me up, and by chance happened to live at a classic viewpoint for Mt. Reka. He hosted me for dinner, a shower and camping on his parents’ fjord-front property. While setting up my bivi sack bedding outside for the evening, I watched him check his arrow-shaped salmon net, which pointed away from the shore to catch any fish swimming out with the tide. Before I went to sleep, I captured a favorite trip photo, Mt. Reka backlit by the midnight sun. At that time, I did not learn my host’s name, but I cherished his hospitality. Coincidentally 22 years later, Jarle’s sister May-Liss happened to find Mt. Reka on my web site Photoseek.com, and asked me via e-mail for a copy of the image to give to Jarle as a Christmas gift! I happily sent her a copy of the image and exchanged well wishes. Jarle married in 1995 and lives with his wife on the same wonderful fjord front property. The next morning at the luxurious Svolvær Youth Hostel, still feeling hungry from Nepal, I stuffed myself for breakfast on smørbrød (“butter + bread”), the traditional Scandinavian open-faced sandwich, upon which you spread jam, sweet hazelnut butter, cheese, fish, liver paste, kaviar, and so forth. (The hazelnut butter tasted like the egg jam that I ate in Singapore in March.) I loved everything except the brown geit ost (“goat cheese”), a Norwegian staple which I found too pasty and pungent. I much preferred the traditional Norvegia cheese, a mild white cheese with holes. Two friendly Swedish women introduced me to Scandinavian kaviar, made from the roe (egg-laden ovaries) of cod, to which I became addicted for the remainder of my stay in Norway. Curiously, this kaviar (or caviar / caviare in English) comes in a convenient squeeze tube, resembling a red, salty, fishy-tasting toothpaste! I preferred the inexpensive 300-gram tube of Kavli Kaviar, the highest quality brand, which would last for a week of camping. The tiny eggs of Scandivavian kaviar measure only half a millimeter in diameter, in contrast to the famous Russian caviar which contains expensive sturgeon eggs measuring five millimeters. I next hitchhiked westward to Stamsund, an attractive fishing village on the next island. A variety of local Norwegians gave me rides, including two truck drivers, a man in an expensive car, and a farmer’s wife on the way to play bingo. Most of them spoke little English, but we enjoyed trying to communicate with what few words we knew of the other’s language. I would say Jeg snakke lite norsk, meaning “I speak little Norwegian.” In 1981, the Norwegians who spoke English tended to be under 30 years of age, reflecting language courses introduced to their generation in public schools. I crossed between the islands of Austvågøy and Vestvågøy on a ferry which has now been replaced by a gracefully-arched bridge. In linking their fjord-pierced country, the Norwegians may have spent more per capita on bridges than any other country. Stamsund was a more tranquilly beautiful version of Svolvær. In the relaxed Stamsund Youth Hostel, which was renovated from a fisherman’s shanty resting on harbor pilings, I cooked a delicious meal from some freshly caught cod. I climbed the mountain above Stamsund for a good view. Just as I prepared to leave Stamsund on the coastal express, the sun pierced the overcast low in the sky, creating beautiful reflections of boats and red rorbus reflected in the mirror of Stamsund Harbor. Tall racks of drying cod soaked in the sun’s rays. I madly rushed around snapping photographs, then with just three minutes to spare, I breathlessly caught the steamer leaving for the mainland. As the ship plowed towards Bodø on the mainland, I said a fond goodbye to the Lofoten Wall shrinking behind under the orange glow of the midnight sun. On June 19, I crossed the Arctic Circle southwards by train, leaving North Norway and the land of the midnight sun. However, the midnight skies would still glow starlessly throughout July in southern Norway. Returning to the unremarkable scenery of Trondheim, I completed my 11-day circle through Sweden and North Norway. I continued south by train to Oppdal, where I began a hitchhiking tour that would take me all the way to Stavanger, through the most spectacular fjord scenery in Norway. With great luck, I hitched on my second ride from Oppdal 15 miles directly to the trailhead for Innerdalen (“the Inner Valley”), one of Norway’s most beautiful valleys. I squeezed into the back seat of a Volkswagon Beetle between the two backpacks of Kari and Ola, a local couple who by chance planned the same hike to Renndølseter Hut. I thought that I had left the icy-cold rain back in Narvik, but Innerdalen spat the same weather upon us. Just as in Narvik, the next day proved to be an incredibly beautiful, sunny summer day. I climbed 3300 feet in two hours up the shoulder of a mountain for a refreshing panorama of the Trollheimen Mountains and Innerdalen, dominated by Dalatarnet (“The Tower of the Valley”), a 4600-foot pyramidal spike like a small Matterhorn, or geologic “sugarloaf”. Next to it, a perfect “hanging valley” abruptly spilled into the main valley, marking where 18,000 years ago, a side glacier met the top of the main Innerdalen Glacier. Kari and Ola offered me a ride which evolved into dinner at Kari’s flat in Hjelset. While waiting for pizza to cook, we watched a curious game show on Norwegian television, where the object was to identify jigsaw pictures of flowers and animals. Norwegians certainly love nature! After dinner, on his way home to Valldal, Ola left me off at a crossroads where I could hitchhike to my next goal. I stepped off the road to set up camp for the night in a grove of fir trees on the edge of a fjord. I would see Ola again in just four days. In the morning, very few cars drove by because tourist season had not yet begun. I waited 3 hours on that backcountry road before an Oslo engineer picked me up for the 18-mile drive to Lake Eikesdalsvatn. (Luckily, I did not have to wait for a ride as long as my brother Dave did for two and half days in the outback of Australia!) I ferried across Lake Eikesdalsvatn to Hoemsbu, a self-service hut in the cellar of a sheep farmer’s house. The gray day slightly reduced the grandeur of the peaks which impressively rose a vertical mile above the lake surface. In perhaps my riskiest venture in Norway, I walked alone over a 4600-foot pass, of which the top 1300 feet were steep snow. I put plastic bags between my socks and boots to keep my feet insulated from the snow. Snow mostly buried the red “T” trailmarkers, and I only found my way by discovering the tracks of someone who had crossed earlier. I climbed and descended 4600 feet in 9 hours through rain, fog and snow, transitioning from snow-covered alpine to rainforest (reminding much of backpacking the Copland Pass Track over the shoulder of Mt. Cook in New Zealand in February). Feeling both proud and relieved, I traversed the pass to the next valley bottom, where I fell fast asleep in my bivi sack. The next day, on a 10-mile walk to the town of Åndalsnes, I enjoyed meeting a friendly Czechoslovakian couple who were hitchhiking and rock-climbing on a six-week vacation, and carrying all of their belongings in duffle bags with shoulder straps but no hip belt. At the Åndalsnes youth hostel, I joined an impromptu dinner of à la dente spaghetti with an Italian man, two French women, a French Canadian, and a Swiss German man. Then two charismatic German men entered and stunned us by announcing their plans to parachute from the 3300-foot Troll Wall (Trollveggen), the highest vertical cliff in Europe! I immediately pictured the incredible films I had seen of BASE (“Building, Aerial, Span, Earth”) jumpers leaping from the 3500-foot overhang of El Capitan in California’s Yosemite Valley; however, fickle winds and bad weather make the Troll Wall much more dangerous. The next day, rain canceled the Germans’ jump, and they had to wait a full month for suitable parachuting conditions. I would learn their fate near the end of my trip, which I tell later. Rain shelved my plans to see the spectacular Romsdal (the deeply glaciated Roms Valley sided by the Troll Wall). After waiting for a ride 2.5 hours in the rain, I resorted to taking a bus to reach Valldal in order to again see Ola, whom I met at Innerdalen. The bus labored up the steep switchbacks of Trollstigveien (“the Troll Path”), sometimes reversing to turn a hairpin curve on the second attempt. Mists hid the famous views. At his flat in Valldal, Ola whipped up a delicious dinner featuring cuts of ox meat. Although he spoke limited English and my Norsk (“Norwegian”) was next to nil, his slide show of mountain walking in Norway and (the former) Yugoslavia broke any language barrier. In thanks, I later sent him prints from my trek in Nepal. The next morning, Ola took me to the ferry, where I met the Kunz’s, a Swiss German family of three, who drove me to Geirangerfjord. In September, I would visit the friendly Kunz’s at their photo store in Bern, Switzerland. Traveling alone motivated me to meet many more people than I would if I had a companion along, which made Norway especially memorable for me. The tourist town of Geiranger prospers from spectacular Geirangerfjord, the epitome of Norwegian fjords. In summer, the town speaks mostly German, and world class cruise ships anchor daily. An elegant Russian liner pulled in as I watched. Many Norwegians claimed that summer had the worst weather in 40 years, but usually the sun shone for me at the major sights, including Geirangerfjord. I left my luggage at the fjord-front campground and walked up 12 switchbacks of the Eagle Road for an amazing view of the dark-green, snake-shaped Geirangerfjord. I ferried the impressive Geirangerfjord and hitchhiked to the wider and similarly remarkable Hjørundfjord, but with no foreign tourists in sight. I ferried up and down the sparsely populated Hjørundfjord, deciding eventually to camp at Trandal, a 21-person farming community clinging to the steep slopes, accessible only by ferry. An old man at the dock led me up the hill and took me to a house where a woman spoke English. She happened to serve as postmaster for Trandal, whose name means “Cod Liver Oil Valley”. I inquired about camping spots, and the woman and her husband eventually gave me a comforting dinner, room, and hot shower. Their spacious new dream house built of handsome wood contained all modern conveniences, electrified via a cable laid beneath the deep waters of Hjørundfjord. They shared raising 200 goats with three other families, rotating into a vacation of half a week every week and a half. Near fjord level, they cut the grass two or three times per summer for winter fodder, which they hung on parallel wire fences to dry, creating a distinctive sight seen throughout fjordland. While this hay dries at low elevations in summer, the goats graze high pastures. Norwegians call a homestead on the high summer pasture a sæter (or seter). The next morning was sunny and uplifting, and I thanked the postmaster and her family for their generosity. I boarded the ferry along with the goat milk truck, which was collecting milk from each local farm. I enjoyed this spectacular “milk run” on Hjørundfjord. Now saturated by gorgeous scenery, I decided against walking up impressive Mt. Slogjen, which rises directly from Hjørundfjord nearly a vertical mile. After 15 cars passed me in 3 hours waiting for a ride, I finally flagged down a bus. In fine weather, I bused and hitchhiked 75 miles to the famous Briksdalsbreen (“The Briksdal Glacier”), where I camped. As in Geiranger, the summer language in Briksdal is also mostly German. Touristy horse carts draw dozens of older couples to Briksdal Glacier, which snakes down 3000 feet from its source of Jostedalsbreen, an ice plateau which is the largest glacier in Europe (171 square miles & 1000 feet thick). The Briksdal is one of 24 glacial tongues that originate in Jostedalsbreen at about 6500 feet elevation. I saw long jagged ridges of ice perched atop the mountains around me, hinting at this huge ice plateau beyond, which I hear is very exciting to explore using mountaineering equipment. The next five days I zoomed through fjord country catching ride after ride, heading for Stavanger and a nearby wonder of nature called “the Pulpit”. Ferrying across Sognefjord at Vangsnes gave striking views. On my longest day, I hitchhiked 145 miles, ending up in a hotel room furnished by Olav, a generous cannery representative on a solo sightseeing tour. On our way to Voss, Olav took us on a scenic sidetrip to Stalheim, which stunned me with its view over the Nærøy Valley, dominated by a 3000-foot granite dome, reminiscent of California’s Yosemite Valley. I vowed to return to Stalheim, which I did 9 days later. Situated at a major road and rail junction, Voss was the busiest tourist town that I experienced in Norway, and tourists mainly spoke American. Americans notoriously zoom around Europe on railpasses, spending only a few days in each country, as immortalized in the movie “If This Is Tuesday, This Must Be Belguim.” Americans tend to concentrate on ralways, since they usually don’t rent cars in Scandinavia. Many Americans stop in Voss on their quick rail trip between Bergen and Oslo, the two largest cities in Norway. Americans usually ride the nearby Myrdal to Flåm rail line, the most accessible fjord attraction in Norway. However, trains cannot reach most of the best fjord scenery, so Americans often miss the great highlights that other European tourists see from cars. I caught an instant ride leaving Voss with Ole, a young Norwegian who spoke excellent English. When I asked Ole why I had seen so many mentally and physically handicapped people on the public transportation systems, he explained that Norway actively encourages the disabled to engage with their world, and also 1981 was the International Year of the Handicapped. Socialistic Norway devotes a healthy portion of its North Sea oil profit to such beneficial social programs. The United States has the same proportion of disabled people as Norway, but offers much less public social support. I ferried then hitchhiked the length of Hardangerfjord in a large goat truck. Builders carved the narrow fjord road into the granite a hundred years ago, leaving room for only one and a half goat trucks. Only the occasional turnouts allowed large vehicles to pass. My driver passed others at breakneck speed, leaving little room for error. Pelting rain added to the atmosphere of our wild ride through 80 miles of fjordland, my longest single ride. At Åkrafjord, we again barreled along an even narrower road that clung to the side of sheer granite walls. At one point, my wry driver pulled in his mirror in order to squeeze past a truck-trailer rig! This was one of the main highways to Stavanger, Norway’s fourth largest city. With additional rides from a Coke truck and a German couple, I reached Vikedal, a town seemingly in the middle of nowhere, where I camped in the nearby woods. On the next day, oil derrick workers gave me two of three rides, indicating my proximity to oil-rich Stavanger, the main port for Norway’s generous share of North Sea oil. The oil workers said they worked 14 days then vacationed for 21 days in a regular cycle. Sounds like a good job! At the trailhead for “the Pulpit” (Prekestolen), I discovered that a group of German teenagers had fully booked the mountain hotel (Prekestolhytta). Tired by nonstop hitchhiking, I camped outside in the occasional rain. To keep out the clouds of tiny mygg, the biting midges which can pass right through mosquito netting, I had to seal my bivi sack, making an uncomfortable and stuffy atmosphere for sleeping. Luckily midges did not bother me anywhere else in Norway. I hear that midges can be a nuisance just after the snow melts in Lappland and North Norway. On July 4, I awoke to an overcast sky and occasional rain. I ate breakfast of the usual smørbrød cold cuts, while pacing back and forth to avoid the midge cloud. Finally, during a break in the warm rain, I struck out along the muddy trail, determined to see the Pulpit despite the misty weather. I walked 1.5 hours through an eerie landscape of blocky mountains, sparsely peppered with trees. 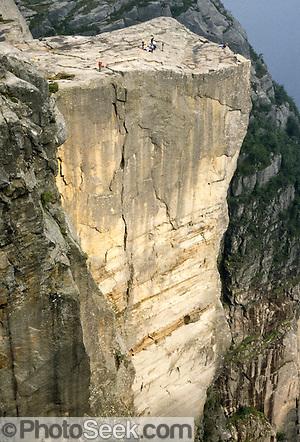 Suddenly the Pulpit appeared, and my eyes bugged out at Lysefjord, 1959 feet directly below. As a tourboat drew into view down on Lysefjord, I quickly snapped my favorite photo from Norway: a lone traveler perched atop the Pulpit, high above the tourboat pulling into the sun’s reflection. The sun came out and I photographed every view. The Pulpit, an impressive sharply-cut monolith of rock that juts above Lysefjord, was yet another highlight of my trip, joining the ranks of the islands of North Norway, Innerdalen, Geirangerfjord, Nærøy Valley, and Briksdal Glacier. 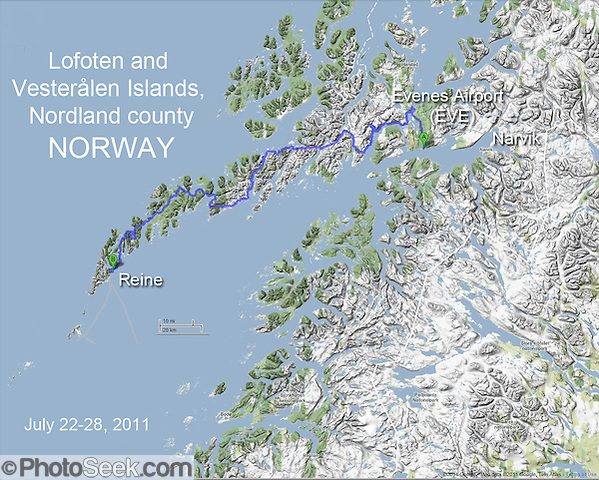 I had just completed a hitchhiking journey of 621 miles (not counting buses and ferries) from Oppdal to Stavanger. At that point, only halfway through my 58 days in Norway, I was becoming scenically saturated. As a spur of the moment day away from nature, I wandered Stavanger, admiring the white-faced row houses of Old Stavanger and the big tankers in the harbor carrying liquid natural gas (LNG). On that beautiful summer day, people even swam in the ocean, taking advantage of a heat wave. I slept overnight on the train from Stavanger to Oslo, where I restocked my photographic film supply, then zoomed on to Finse, the highest railway station in Norway (4268 feet). Stepping off of the train on July 6, I entered a world still locked in winter. The lake was one-third covered in ice, the ground was half-covered in snow, and the temperature was 40° F. (10° C). DNT had advised me correctly, saying mountain areas would be snow-covered until about now. In the next three weeks, I would hike above Sognefjord (in two places), on Hardanger Plateau, and in the Jotunheim Mountains. Many other natural wonders in Norway have been tapped for human use, such as Mardalsfossen (above Lake Eikesdalsvatn), formerly the highest waterfall in Europe and the sixth highest in the world. Now engineers turn on Mardalsfossen only in July for tourists to see, and the remainder of the year they divert it for hydroelectric power. Engineers have also reduced the volume of one of Norway’s most stunning waterfalls, Vøringsfossen. These and many other water power schemes make Norway the European leader in hydroelectric development. At the tourist town of Aurland, I caught the famous ferry through Aurlandsfjord and Nærøyfjord (the southern tongues of Sognefjord, longest fjord in Norway). Accessibility by rail makes this fjord tour one of the most well-known attractions in Norway. I rate Nærøyfjord as second only to Geirangerfjord in grandeur. Nærøyfjord, billed as the narrowest fjord in the world, squeezes only 600 feet wide between cliffs that rise 3000 to 5000 feet. I bivied at a motorcamp in Gudvangen in the mile-deep trench of the amazing Nærøy Valley. I hitchhiked up the Nærøy Valley, the cousin of Yosemite Valley, and returned to Stalheim as I had vowed on July 1. At Stalheim, I played my usual photographic game of waiting hours on end for the sun to come out. Finally, the sun shone feebly on the impressive 3000-foot dome of Jordalsnuten. The same day, I walked six hours to a snowy retreat called Grindaflethytta (“Grindaflet Hut”, 3574 ft elevation), halfway between Stalheim and Flåm. Halfway to the hut, rain began to fall, and I knocked on the door of a tiny cabin, where an extremely friendly dentist and his wife invited me inside for tea. They gave me valuable advice on where to backpack on the Hardangervidda, my next goal. I rested all the next day alone at the luxurious, self-service Grindaflet Hut. On the hut radio, I created musical electronic noise as I searched for stations. Radio Moscow competed with Voice of America on the crowded European band waves. BBC said “Let’s Speak English.” Outside, reality drizzled rain on the melting snowy landscape. Inside, I comfortably sifted memories from my trip around the world. That descent reminded me much of walking the rugged Dusky Sound Track in New Zealand with my brother Jim. The Flåm Valley strongly resembles the rain-forested glacial valleys of Fiordland National Park, New Zealand (where they spell “fiord” with an “i” instead of “j”). However, instead of the dense beech forest of New Zealand’s Fiordland, Norway’s fjordland has spruce, fir and birch forest, plus its snow and alpine zones start closer to sea level. I finally rode the famous Flåm to Myrdal railway line, the most expensive 12-mile section of standard-gauge railway in the world. Unlike the special rack railways of Switzerland, the Flåm to Myrdal line runs on ordinary railway tracks, and overlaps itself five times in one spot on its ascent of 2845 feet in 12 miles. The train plunges through so many dark tunnels (20) that it is more impressive as an engineering wonder than a scenic one. I returned to the DNT hut at Finse, completing a round trip of seven days. For dinner, I found a new treat: sauerkraut in a box. From Finse, I rode the train then hitchhiked onto the Hardangervidda (“Hardanger Plateau”), Norway’s second most popular hiking area. Hitching with two French students, I visited the breathtaking Vøringfoss, a powerful waterfall that thunders 597 feet from the Plateau to fjord country. Hydroelectric projects have diverted some of its roar, but Vøringfoss still impressed me. The students left me at Sæbø, near the eastern end of Hardangerfjord. Since I would again be sleeping in mountain hotels, I left excess weight, such as Ensolite pad and bivi sack, with a campground manager. I ascended 2600 feet on a farm road, switchbacking twenty times to reach a trailhead. My head ached most of that day, and I finally admitted that I felt lonely. Traveling alone for six weeks had taken a toll on my spirit. Along the way, some unnaturally friendly sheep ran up and followed me, bleating loudly! This was the third trail where sheep had followed me, perhaps hungry or lonely. On my previous hike from Stalheim to Flåm, a sheep had approached and sniffed me. On my earlier hike from Lake Eikesdalsvatn to Åndalsnes, a flock of ten sheep had run across a steep snow field and followed me excitedly! These sheep seemed overjoyed to see me in their isolated summer pastures, in sharp contrast with the flighty, dull-witted behavior of the penned hordes of sheep I saw earlier that year in New Zealand. Encouragingly, my headache disappeared when I socialized with fellow walkers at Viveli mountain hut, four hours later. Once I had ascended from fjord country up to the Hardanger Plateau, walking became a breeze on the gently undulating top. Hardangervidda is probably Europe’s largest alpine plateau, measuring 40 by 60 miles, resting between elevations of 3000 and 4000 feet. Entirely above treeline, the desolate Hardanger Plateau fascinates many wilderness lovers. I had heard good reports about the Hardanger Plateau in conversations as far away as Nepal and New Zealand: nice scenery, lakes with good fishing, and a variety of alpine flowers (200+ species) and wildlife (reindeer, ducks). As I walked to Hadlaskard mountain hotel, the hat shape of Mount Hårteigen (5500 feet) popped into view, a striking erosional anomaly on the relatively flat plateau. Climbing Hårteigen required a tricky ascent up a very steep snow gully. I methodically kicked snow steps upwards. A slip could have dropped me instantly onto rocks below. I definitely needed a rope and ice ax for safety. But with confidence and care, though, I topped Hårteigen and was rewarded by a striking panorama of undulating hills striped with snow like a zebra. To the north, I saw the sprawling permanent ice cap of Hardangerjøkulen (“the Hardanger Glacier”). I had the summit to myself. Beautiful summer days such as this made my journey all worthwhile. Descending Hårteigen took just as much care as the ascent . . . but I concluded my venture with a triumphant slide down the snow chute! None of the 20 passers-by had attempted the climb that day. At the next mountain hotel, Torehytta, I became the legend for the day with my story of climbing Hårteigen. I encountered the most crowded hut of the trip at Torehytta: fourteen people in bunks and three (including myself) on the couches. Tourist season, July 15 to August 15, had begun! Two days later, I hiked the spectacular transition from the Hardanger Plateau to fjordland. Huge cascades of water paralleled my course as I descended 3300 feet across smoothly glaciated granite and fir forest. On a hot summer day, I reached Kinsarvik, an important junction town on Hardangerfjord. Since I had passed through Kinsarvik two weeks earlier, I was surprised at how the campgrounds had become choked with visitors in such a short time. I hitchhiked back to Sæbø to collect my extra camping gear, then continued on to Geilo with a young Norwegian man, who was playing Bob Marley and Pink Floyd on his tape deck. He commented that American popular music reaches Norway five or ten years after its release. On the train to Gol, to my great surprise I was surround by a carload of Russian tourists, who were visiting Norway in two days, like many Americans do. None spoke English. I conversed in basic French with a Russian cardiology professor. With extreme curiosity, the Russians riddled me with questions about the prices of cars, houses, and wristwatches in the United States, and were amazed at the low price of my digital wristwatch. We reached Gol all too soon, and I had to step off that exotic train car. This brief brush with Russia provoked my excitement as much as my four-hour layover in Moscow Airport, on the way to Europe from Nepal. In 1981, the “Cold War” was thawing quickly, and Russians and Americans had a lot to talk about. In searching for a camping place across the river from Gol, I bumped into a group of six French campers in the bushes. We conversed in English, which they spoke better than my French. They eventually invited me to dine and camp with them. Several weeks later, I would visit one of them, Philippe Contet, in his hometown of Chalon-sur-Saône, in the province of Burgundy, France. Philippe’s study of electrical engineering required many journals written in English and motivated him to learn my language. From Gol, I hitchhiked in two rides to the “Home of the Giants”, where I would hike my last and best backpacking trip. One driver, a farmer’s wife, told me that she and her kids seated in the car, ages 8 and 10, had recently walked up Norway’s two highest peaks! I had pictured these peaks as arduous climbs, and now her kids seemed to be bionic athletes. I would soon find out for myself in my climb of Glittertind, Norway’s second highest peak. I spent five days in Jotunheimen(“the Home of the Giants”), the highest mountains in Scandinavia. I stored excess weight at Gjendesheim, a DNT mountain hotel on the shores of the glacially green Lake Gjende. I was surprised to see the nearby ridges free from snow, despite being higher than snowy Finse. Then I learned that the 8000-foot Jotunheim Mountains capture the bulk of winter snowfall into a dazzling display of glaciers and snow-capped peaks, creating a drier “snow shadow” area around Gjendesheim. For an evening walk, I hiked up 2600 feet to Veslefjell Ridge, which drops steeply down to Lake Gjende (elevation 3240 feet). Shaped like a link sausage, beautiful Lake Gjende stretched off to the foot of the distant snow-capped Jotunheim Mountains. Turning around, I suddenly spotted a dozen reindeer which were grazing the thin layer of yellow lichen on the otherwise bare rocks. Reindeer prefer high ridges like this one. I approached to within 50 meters of the reindeer, noticing large racks of antlers on the noble beasts. I felt privileged to share this place of stark beauty with these fellow wanderers of nature. At 7:00 AM, I embarked across Lake Gjende on a motorboat, packed like Lofoten sardines with fellow walkers who would traverse the famous Besseggen Ridge that day. I stepped off the boat at Memurubu, located at the “link” of the two sausage shapes of Lake Gjende. The six-hour walk back to Gjendesheim provides a stunning view from Besseggen Ridge, one of the best sights in Norway, if not the world. I walked up the ridge 1300 feet to Lake Bessvatn, then another 1000 feet where the ridge became a quite narrow and airy “hogsback”, with a remarkable view back down to light green Lake Gjende and the adjacent contrasting deep blue of Lake Bessvatn. In the distance rose the snowy glaciated peaks of the Jotunheim Mountains. Norwegian dramatist Henrik Ibsen immortalized this place when he described Peer Gynt’s wild ride on the reindeer across Besseggen Ridge. Leaving camping gear behind in Gjendesheim on the following day, I walked seven hours over stony ground to Glitterheim hut, “home of Glittertind“, which is officially the second highest peak in Norway (8047 feet). However, a 60-foot-thick snow cap on Glittertind makes you stand at 8107 feet, the highest point in Scandinavia. 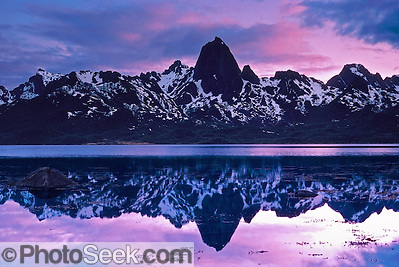 Officially, the highest mountain in Norway is Galdhøpiggen (8102 feet), located across the valley from Glittertind. By now in excellent physical condition, I easily hiked up 3500 feet in two hours to the top of photogenic Glittertind, which sports a jaunty ice cap that overhangs an impressive 1500-foot deep cavity. I saw a fantastic panorama of glaciers and peaks, another highlight of my tour. Although the Norwegian peaks only reach about 8000 feet above sea level, in my book, their snow-capped beauty match the great mountains of the world, including the Himalayas, the mountains of the Americas, and the New Zealand and Swiss Alps. Not only that, many Norwegian peaks can be hiked by the whole family, everyone from young kids to senior citizens, plus their dogs. (Norway also offers many challenging technical climbs, such as the Troll Wall, rated as one of the world’s six most difficult rock climbs.) To descend, I joyously slid 3500 vertical feet in one hour down the snow. In my previous seven weeks, I had seen highlight after highlight without much rest. Tired and saturated with incredible scenery, I decided not to climb Galdhøpiggen, which has a view similar to Glittertind. The next day, in another stony walk, I hiked five hours out to Spiterstulen, a mountain hotel connected by road to civilization. To complete one final unfinished sight, I returned to Åndalsnes in order to see the spectacularly glaciated mile-high walls of Roms Valley, which rain had obscured earlier. I just caught sight of the shear 3300-foot vertical drop of the Troll Wall as the fickle mists parted, then closed again. “That’ll do” I thought. Burnt out by my almost nonstop journey through the great scenery of Norway, I zoomed back through Oslo, Copenhagen and Hamburg to return to home base with an American friend in Frankfurt, sleeping two nights in a row on the train. I did not mind giving up the two extra days remaining on my two-month Eurail pass. My initial ignorance of the snowy conditions of the Norwegian mountain walking areas in June became a blessing — that time was spent discovering the fantastic Lofoten and Vesterålen Islands of North Norway and the spectacular fjordland of southwest Norway. Because most of the great sights and experiences are not directly accessible by rail, I hitchhiked via car 1100 memorable miles, meeting many wonderful and generous Europeans. To this day, Norway remains vivid in memory as my longest solo journey. Actually the trip began alone, but I met many friendly people along the way. On the trail in the Jotunheim Mountains, I encountered Willie Aeberhard, who would later host me for four days in his home of Sarnen, near Lucerne, Switzerland. And don’t forget Ole, Ola, and Olav (above). I loved hiking Norway’s wilderness with a light pack, using its extensive network of well-marked trails and huts, the world’s best refuge system. Areas away from heavy tourist influence were most enjoyable, away from train lines and in the off season. When in Europe, don’t miss Norway, one of the most beautiful countries on earth. Den Norske Turistforening (DNT), office at Storgata 3, two blocks from Oslo Central (train) Station. Mountain Touring Holidays in Norway, an excellent hiking guidebook published by the Norway Travel Association, Oslo. Check for a copy at the DNT office. Search for latest “Norway travel books” at Amazon.com. Lonely Planet Norway (Country Travel Guide, 2011) by Graeme Cornwallis. Full of excellent, detailed advice, crucial for planning and carrying on the trip. Norway: DK Eyewitness Travel Guide (2012) Glossy book series helpful for inspiration and trip planning. Norway (Eyewitness Travel Guides, 2010) by Snorre Evensberget. Walking in Norway (Cicerone Guides, 2011) by Connie Roos. Long distance hut walking treks using public transportation. Scandinavian Mountains and Peaks Over 2000 Metres in the Hurrungane (2005) by James Baxter. Plan hikes in the highest mountains of Norway. Norway offers beauty around every corner, from fjordland to Nordland. Norway, home of the Nobel Peace Prize, is a model world citizen respecting both people and the natural world. Tortured terrain, turbulent history, cold winters and brief summers evolved hardy Vikings and modern Norwegians who live close to the land. In fact they tunnel right through it. One day we drove 30 tunnels, one as long as 7 miles! 1981 solo 2-month trip in Norway when I was 25 years old. Roads starting from sea level must negotiate three to six thousand feet up steep cliffs to reach the central plateau that forms most of Norway. Deep seawater stretches inland through the Scandinavian Mountain Range as far as 125 miles at Sognefjord. If unraveled, the fjord-pierced coastline would stretch for 21,000 miles. “The sea unites, but the land divides.” Since Viking times (about 800 to 1000 AD), boats have linked remote coastal towns. Impenetrable terrain resisted roads, railways and communication lines until North Sea oil was discovered. Oil helps pay for impressive bridges, tunnels, rails and generous social support (long maternity/paternity leaves, free education including college, retirement Pension Fund for all). Norway has 5 million people in an area 20% smaller than California. Despite its high latitude, Norway’s climate is relatively mild. The North Atlantic Drift, partly fed by America’s warm Gulf Stream, keeps fjords ice-free in winter as far north as Hammerfest, at 71° North latitude (icy Alaska’s northerly tip). Two out of three days are cloudy in summer, surrounding the peaks and plateaus with mysterious mists, until every third day when sun shines glory upon the glacier-carved mountains. Norwegians pioneered the study of weather because their home gets so much of it! Stave Church images include Heddal, Eidsborg, Borgund, Lom, and Urnes. Stave refers to the load-bearing posts which support interior beams. The state Church of Norway (Den norske kirke in Bokmål or Den norske kyrkja in Nynorsk) was established after the Lutheran reformation in Denmark-Norway in 1536-1537 broke ties to the Holy See of the Roman Catholic Church. When driving from Oslo to Heddal to Lysefjord, tour the Rygnestadtunet farm museum which dates from 1590 AD in Valle municipality, Setesdal, Aust-Agder. See the Hardanger Folk Museum in Utne to learn of fiddles, lacework, and the national costume. Above map: Rent a car at Evenes Airport (EVE) and drive round trip to our favorite town of Reine in northern Norway. July 22-28, 2011. The “Norwegian traditional district” known as Lofoten is a beautiful archipelago of islands above the Arctic Circle in the county of Nordland. Explore the scenic towns of Svolvaer, Stamsund, Nusfjord, Hamnøy, Sakrisøy, Reine, and Å. Admire vistas of Torsfjorden and Selfjorden. Above Reine village, ascend a harrowingly steep trail to Reinebringen for spectacular views of sharply glaciated peaks surrounding Reinefjord, on Moskenesøya (the Moskenes Island). Take a passenger ferry on scenic Reinefjord to Vindstad for a fun and easy walk to Bunes Beach. Lodging is tight in Reine at the most spectacular end of the Lofoten islands. Reserve rooms or rorbus 3 months in advance. No problem sleeping in a tent or camper. 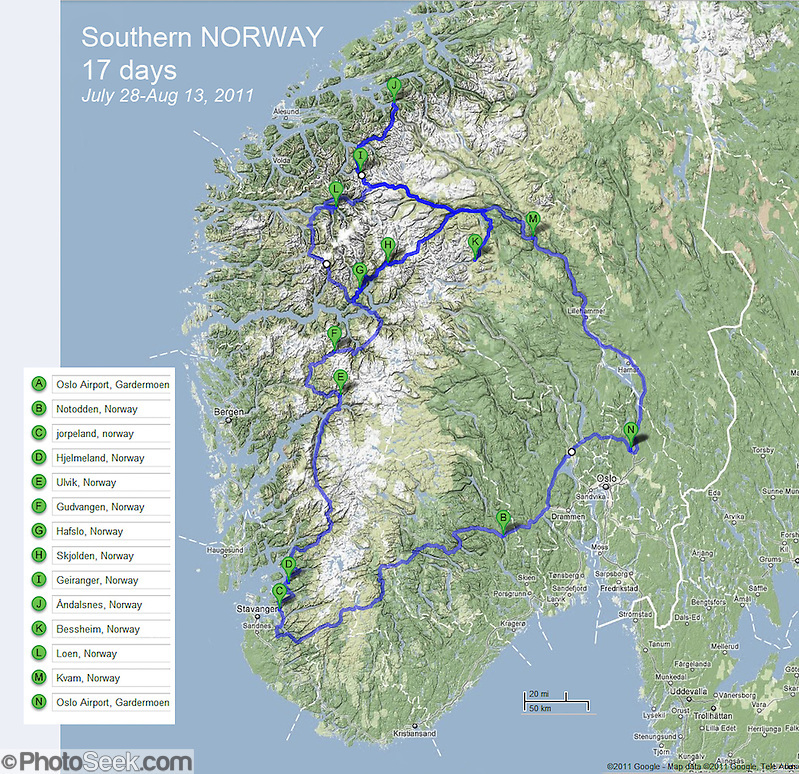 Above map: 17 days of car rental allows a great touring loop of southern Norway (July 28-August 13, 2011), marked in blue starting from Oslo’s Gardermoen Airport (OSL) to Jorpeland (the Pulpit), Ulvik, Gudvangen, Hafslo, Skjolden, Geiranger, Andalsnes, Bessheim, Loen, Kvam, and back to OSL. Alternatively, start from Bergen Airport Flesland (BGO) or Sogndal (SOG) to save travel time when visiting the heart of fjordland. Starting in southwest “fjordland” near Stavanger, hike to Pulpit Rock (Preikestolen / Prekestolen) for a breathtaking view high above Lysefjord. Drive northwards along the edge of Hardanger plateau, through a cultural heartland (Hardanger Folk Museum, Utne). Admire Vøringsfossen waterfall and dramatic gorge. Proceed north to impressive Sognefjord. View Nærøy Valley (Nærøydalen) and Jordalsnuten mountain from Stalheim Hotel and descend the old Royal Mail road of Stalheimskleiva (18% grade). Admire the scenic contrast of Norway’s highest mountains (see Jotunheimen section further below) adjacent to the country’s longest fjord, Sognefjord (with branches Aurlandsfjord, Nærøyfjord, Lustrafjord, Lærdalsfjord). On Innvikfjorden arm of Nordfjord, based in the villages of Olden and Loen (stay at idyllic Lovatnet lake), explore deeply glaciated valleys beneath the tongues of Jostedalsbreen glacier, the largest ice sheet in continental Europe. In Jostedalsbreen National Park, athletically ascend 6047 feet (1841 meters) to Skålatårnet (or Kloumanntårnet) on Skåla, the highest tidewater mountain in Norway. Further north, admire classically beautiful Geirangerfjord branch of Storfjord. Drive Trollstigen (the Troll’s Ladder) to the Troll Wall (Trollveggen) and Trolltindane (Troll Peaks) in Roms Valley. Complete a driving loop back to Oslo. Memorable hiking in the Jotunheim mountains (Jotunheimen or “The Home of the Giants”) includes: the mountain ridge of Besseggen (or Besseggi), Lake Gjende, Knutshøe ridge, Fannaråken mountain (or Fannaråki), Store Styggedalstind, and the Hurrungane range. Almost all inland glaciers in Norway have retreated since 1900. After many Norwegian glaciers temporarily advanced from heavy winter snow in the 1990s, according to the Norwegian Water Resources and Energy Directorate (the most extensive national glacier monitoring program in the world), twenty-five monitored glaciers retreated an average of 190 meters (3% of their total length) from 2000 to 2010. Read more about global warming and climate change.